Cities play a critical role in ameliorating global warming and climate change. 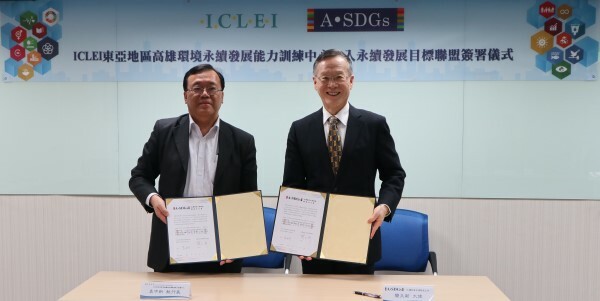 On Tuesday, March 26,the Alliance for Sustainable Development Goals (A-SDGs),held an Alliance partnership signing ceremony at the Taiwan Sustainability Guildhall for the Local Governments for Sustainability Kaohsiung Capacity Center (ICLEI KCC). Alliance Chairman Ambassador Eugene Chien and LCLEI KCC Executive Director Chung-Hsin Yuan jointly signed the Strategic Partnership Agreement, bearing common witness to ICLEI KCC joining the Alliance, and celebrating a new member which will serve to advance cities’ sustainable development efforts for the future. Alliance Chairman, Ambassador Eugene Chien, explained that A-SDGs was formed at the end of last August with members running the gamut of Taiwan’s industry, government, academia and research sectors, while industry participants represent over 50% of Taiwan GDP, and to date there are 13 university members, 3 Science and Industry Park members, and numerous NGO partners along with the central government’s National Audit Office of the ROC (Taiwan). Near the end of last year the Alliance members held the Global Corporate Sustainability Forum (GCSF), which attracted 2,100 participants, fully evincing the present trend for sustainable development. All social, economic and environmental topics are related to sustainable development, and require the common effort of all stakeholders. The ICLEI KCC will afford municipal members’ training, professional knowledge and diversified environmental education and sustainable development policies, administration and information exchange platforms, to cultivate cities’ environmental and sustainable development capacities, synergizing local governments, to make pragmatic contributions to sustainable development, as an indispensable member to sustainable development, so we hope that the addition of the ICLEI KCC to the Alliance will enhance Taiwan’s overall social capabilities for sustainable development.